Step 1: Press Start Button for 1 second, Capacitive Stylus will be started after the blue LED light flashed. Step 2: Press Start Button for 1 second again, Capacitive Stylus will be turned off after red LED light flashed for 3 times. Leave Capacitive Stylus without using for 2 minutes, it will shut down automatically. AMPLER Stylus Pen DOESN'T have Bluetooth or Palm-rejection function. It CAN'T sync with IOS devices. Also, it's NOT compatible with Microsoft Windows devices. 【Compatibility】: This capacitive pen can work with touch screen mobile devices after 2016. It can work on IOS devices like iPhone. Also, it can work on Asus, Huawei or other Android tablets and cellphones. If you are not sure whether the stylus works on your devices, please let us know first. 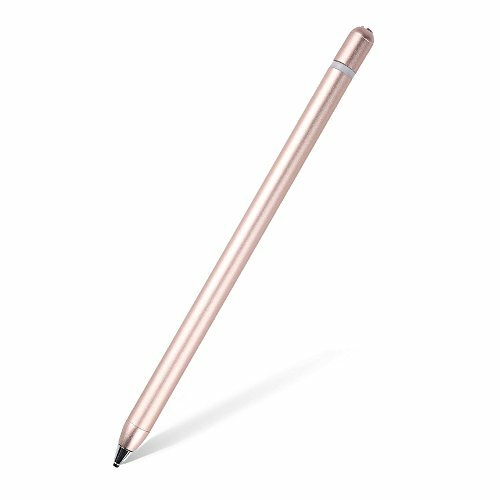 【Top Accuracy】: 2.2mm thin fiber tips on the pen gives you the most accurate touch each you use the pen on your tablets or cellphone. It will exactly follow your order of each touch. 【Fashion Design】: The material on the surface of the pen is similar to metal. When you hold the pen, it feels snuggy and comfortable. Makes you write or draw in more fluent way. 【Caution】: Please note that this stylus pen DOESN'T have Bluetooth or Palm-Rejection function. It's not compatible with Lenovo devices. Please press the power button on top of the pen before using. If you have any questions about this product by AMPLER, contact us by completing and submitting the form below. If you are looking for a specif part number, please include it with your message.